I'll bring my TRIBY speaker with Alexa voice service to the movies! Alexa, what movies are playing right now? ALEXA: There are many movies playing right now but...I'm afraid I'm busy. Washing my hair. Alexa, you don't have any hair. ALEXA: [long pause] I'm seeing someone. 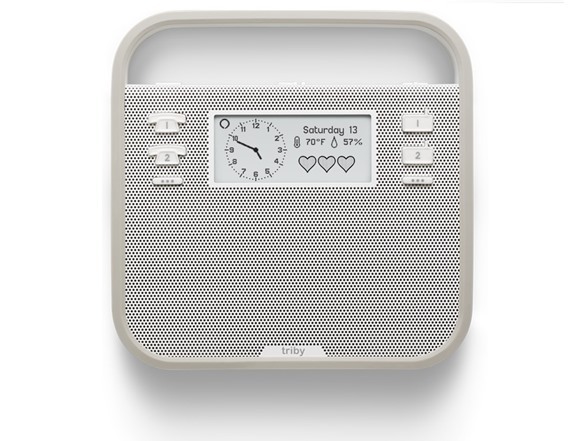 Triby is an Alexa speaker: Use the Alexa Voice Service to play music, provide information, get the news, set alarms, control smart home devices, and more using just your voice. Just say the wake word “Alexa” and Triby responds instantly. Alexa-enabled and portable. Just Ask. Just Ask Alexa to hear the news, listen to music, set a timer, get the weather, control your smart home, and more. New skills are continually added - such as ordering a pizza from Domino’s, asking HuffPost for headlines, or requesting a ride from Uber. Enjoy thousand of skills from third party developers. The Alexa Voice Service is built in the cloud, so it is always getting smarter. And because Triby is always connected, updates are delivered automatically. Triby is more than just another Alexa-enabled speaker. It's a truly portable device that can hear your from across the room. You can activate Alexa remotely with your voice, or locally by pressing the tap-to-tap button. With its embedded battery, take it from the living room, to the kid's room, to the backyard without interruption. And with its magnetic back, Triby can live on your fridge door. Ask Triby to play music from Prime Music, iHeartRadio, or TuneIn. 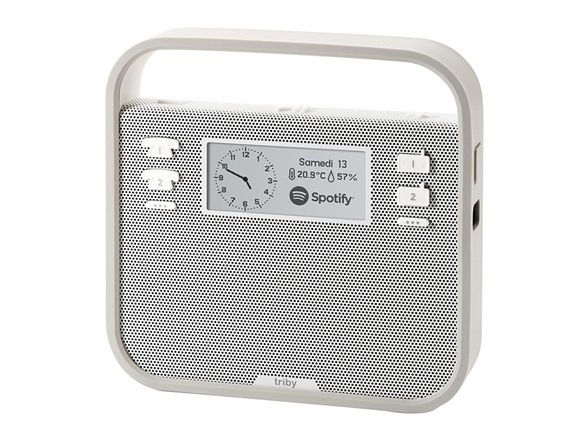 Triby can pair with any smartphone with its Bluetooth connection, or play music from online radio stations and through Spotify Connect when connected to WiFi. You can pre-set your favorite playlists and stations, and access them at the push of a button – even when Alexa is disabled. With Triby, you'll never miss a beat. From time and temperature (even humidity) information to voice-activated timers and alarms, there's a spot for Triby in every aspect of our everyday lives. Triby transforms the fridge memo into a fun digital experience. 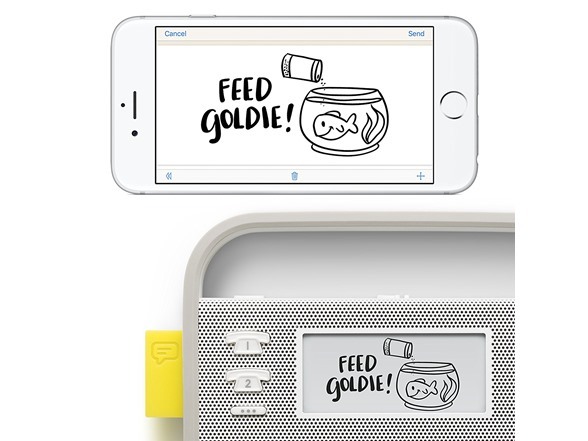 Send messages, emoji and freestyle drawn doodles to Triby ’s E-Ink display via its dedicated app. 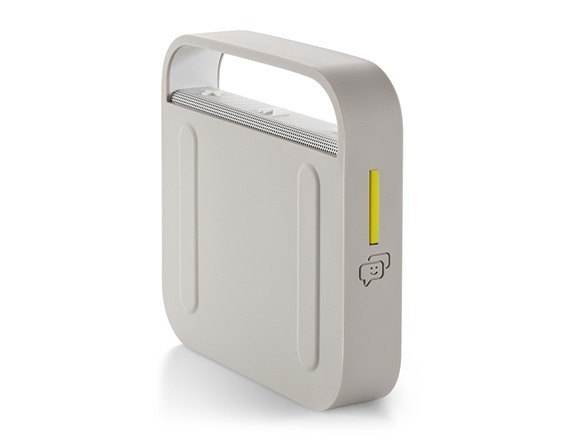 Its fun mailbox flag is raised to alert you to incoming messages, making family communications child’s play. Triby is ready to go in minutes. Using its dedicated app (iOS 8 or above or Android) you can program and control every aspect of the Triby experience. Setup Alexa and manage personal contacts, Spotify playlists, your favorite Internet radio stations and you are ready to go.